President Obama is hosting a special screening of the Oscar-nominated film Selma at the White House. The film depicts the 1965 march from Selma to Montgomery, Alabama led by Dr Martin Luther King Jr. It is a contender for best picture at next month's Academy Awards, alongside seven other films including Birdman, Boyhood and Grand Budapest Hotel. Cast and crew, including director Ava DuVernay, are expected to attend the screening on Friday. The film picked up just two nominations for the Oscars, the second being a nomination for best original song, Glory, by John Legend and Common. 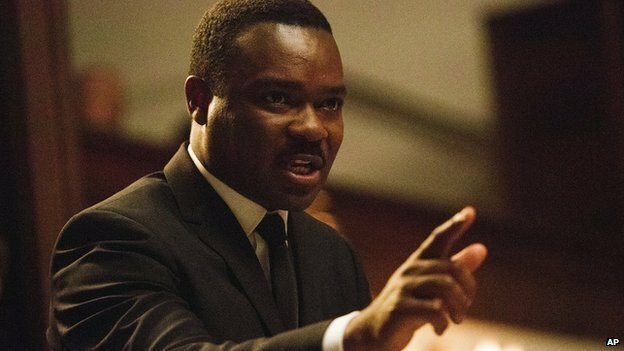 But British actor David Oyelowo missed out on a best actor citation, for his depiction of Martin Luther King, and Ava DuVernay failed to make the cut for best director. Had she been nominated, DuVernay would have become the first African-American woman to be nominated in that category. The Oscar nominations have come under fire from some commentators for their lack of diversity, after it was revealed that all 20 contenders for the acting categories were white. However, the Academy's first African-American woman president, Cheryl Boone Isaacs, told New York magazine's Vulture blog that the organisation does not have a diversity problem "at all". Previous Oscar contenders to be shown at the White House include last year's Mandela: Long Walk to Freedom and Stephen Spielberg's Lincoln in 2012, starring Daniel Day-Lewis as Lincoln. The screening will take place in the 40-seat family cinema, part of Obama's private family quarters, according to Variety. The first movie screened at the White House was in 1915, when Woodrow Wilson hosted a showing of Birth of a Nation. The Obamas have also screened Danny Boyle's Oscar-winning Slumdog Millionaire (2008), Julie & Julia (2009), starring Meryl Streep and He's Just Not That Into You (2009), starring Jennifer Aniston, Scarlett Johansson and Drew Barrymore.